Fires burning in North Korea, captured by the Moderate Resolution Imaging Spectroradiometer (MODIS) on NASA's Terra satellite on April 27, 2015. A NASA satellite has captured the seasonal fires burning across North Korea at present as farmers clear land for fresh crops. 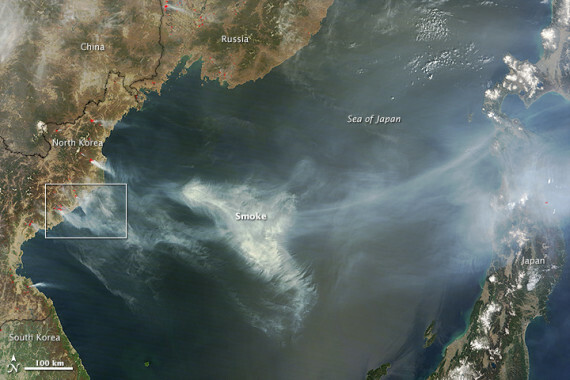 In images snapped by its Terra satellite, smoke can be seen getting carried by the wind right across the Sea of Japan to over Hokkaido and northern Japan. 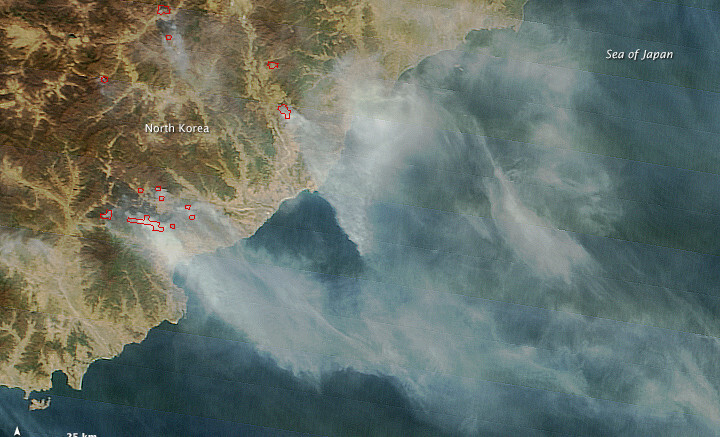 Fires burning in North Korea, captured by the Moderate Resolution Imaging Spectroradiometer (MODIS) on NASA’s Terra satellite on April 27, 2015. The space agency’s analysis says that some of the fires appearing to be burning out of control. The areas that are actively burning, detected by a thermal imaging bands on MODIS, are highlighted in red, as can be better seen in this close-up image. NASA said many of the larger, smokier fires appear to be burning in forested highlands near cultivated river valleys. The satellite began to detect significant numbers of fires on April 23 and they grew to be more numerous and smokier by these April 27 images. A similar image was captured last year at around the same time. In April, as the snow finally melts and ground softens, farmers begin preparing to plant the new year’s crops. 1 Comment on "NASA captures seasonal fires in North Korea"
Reminds me of clearing the rainforests in South America. Just for cultivating crops for biofuel to put in the tanks of lazy people who can’t do without a car even the shortest of distances. First world problems, that unfortunately affect every other place than the “first world”.